sprezzatech blog #0014 — New Directions in Window Management, Part I. New Directions in Window Management, Part I. 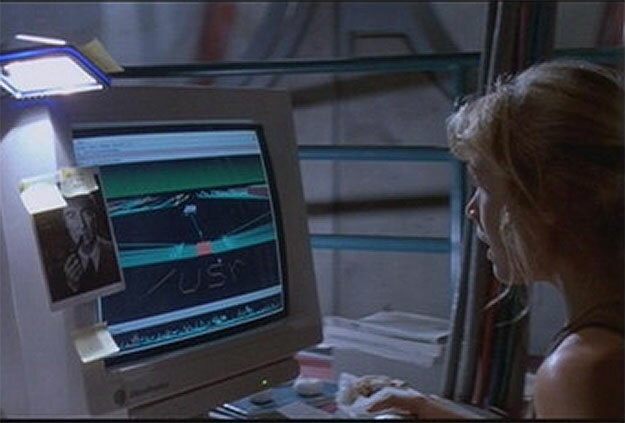 It's a UNIX system! I know this! One day, I hope to have a working XF86Config conffile for it! DISCLAIMER: The author is by no means an authority on user interfaces, human-computer interaction, or computer graphics (indeed, he is something of an anti-authority on at least the first two topics). This report is likely full of errors, omissions, and balderdash. Reader discretion is advised. Rectilinear windows are associated with a single application, which might have multiple windows open. Windows can obstructively overlap, inducing a partial ordering among the windows visible at any given time. Coordination of these windows is the responsibility of a window manager. Icons (minimal graphic entities) are shortcuts through which applications can be spawned. In practice, icon activation typically invokes some represented program using predefined arguments (when associated with an action) or invokes a handler upon the represented entity (when associated with data). Menus (dense, terse, hierarchal selection systems) provide (possibly context-sensitive) control interfaces for a given application. This application might be the window manager itself. Pointers (onscreen symbols corresponding to foci of user interaction) allow input devices to effect selection using up to two degrees of freedom. 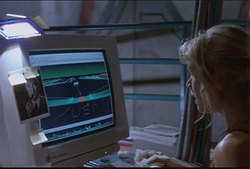 Rectilinear windows and two-dimensional navigation, and to a lesser extent the desktop metaphor in its entirety, owe their pervasiveness to the ubiquity of rectilinear, two-dimensional display technology (it is uncommon to hear the term GUI used in reference, for instance, to volumetric displays) and the rarity of input devices other than the mechanical keyboard and mouse. Icons, menus, and stackable windows are a compromise between ease-of-use (compared to command-line and keystroke-based interfaces) and limited screen real estate. Rectilinear displays are still with us, with a little more than an order of magnitude finer resolution (I used a 320x200 4-color CGA for most of my computing in the 80s; my current Dell U3011 features 2560x1600 resolution on a 30" diagonal), a little less than an order of magnitude more DPI (the newest Retina displays boast 250+ DPI), largely unchanged frame rates, and slightly longer latencies. More starkly changed are gamut (10 orders of magnitude between CGA's 4 colors and 32-bit deep color) and aspect ratio (16:9 widescreen monitors and phones have become prevalent). Moore's Law doesn't appear to hold for video outputs, unfortunately. Drastically changed, however, are the display adapters driving these devices (as well as the general-purpose processors and I/O buses feeding these adapters). My ATARI 400's GTIA TVA and MOS 6502B cranked out 8-bit values at 1.79MHz (i.e., half-pumped against 3.575 NTSC color clocks), sharing 16K of 4K-banked RAM operating at timings of multiple hundreds of nanoseconds. NVIDIA's current flagship single-GPU display adapter, the GTX 680, drives 1536 cores at over 1GHz with their own 256-bit interface to 2GB of 6GHz GDDR5 VRAM operating at timings less than 10ns. This represents seven orders of magnitude more processing power and about three orders of magnitude increased memory throughput. If the fruits of technology are to be employed in better human computer-interaction, then, it is probably better to look at what can be done with this excess compute capacity. Even if displays boasting ~400km diagonals were to become price-competitive, they're awfully hard to get home without scratching something, and tend to throw off-balance whatever room into which they're placed. On the input side, what we've neither gained nor needed in terms of throughput we have won in variety. Touchscreens exhibiting four to five degrees of freedom are commonplace on mobile devices. Advances in solid state electronics and discrete signal processing have made real-time, high-fidelity speech processing a reality. Gyroscope-based mice offering six true degrees of freedom are in wide use among content creation professionals. Interfaces driven by eye movement and even EEGs are on the horizon. The humble keyboard is absent on most mobile devices, supplanted in some degree by text prediction. Modern interfaces must support multiple devices, which may come and go at any time, and must not assume any particular input device to be available. I considered all this recently, and hid old SIGCHI reports behind copies of Intel instruction set manuals so as not to draw contemptuous comments from friends, and read a bunch of topology and differential geometry I kinda partially understood maybe, and thought upon it whilst smoking many Newports. The strewmentarium compositing window manager resulted. More about that the next time we meet. Same dank time, same dank channel. Hack on!